This advertisement utilizes ethos as its main rhetorical device. The image, picturing a woman performing an operation alongside a man, is backgrounded with a quote in front of it. Selecting the image of a medical setting is effective because it shows women impacting the lives of others through a profession that takes knowledge and skill. The quote is shown using bold and large text, which makes it seem important. The reader then sees that it was said by the UN Secretary-General’s Network of Men Leaders, which provides the ethos. Someone in a high position of a men’s organization saying this will cause others to join the cause because of his leadership and well-known role. This advertisement for HeForShe is very effective. This picture uses pathos as its main rhetorical device. 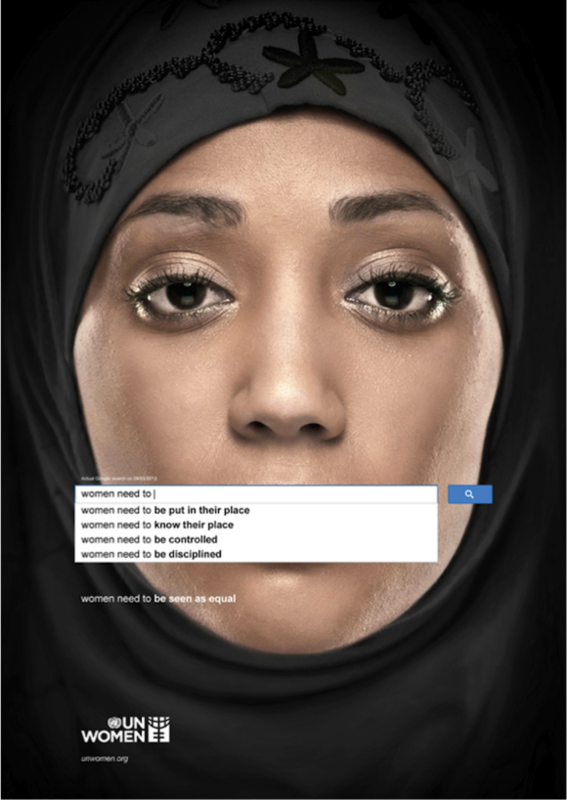 The woman is wearing all black and her face is put in the background, which makes her seem submissive and disregarded. Her facial expression makes the viewer feel compelled to help her because of the helplessness and blankness in her eyes. I find the minimal space used up by the words contrasted with the picture filling up the entire add to be very effective, as it draws attention to the advertisement. That being said, when the viewer reads the words, they prove to be very effective despite their size. I chose to incorporate blogs on gender equality as well as HeForShe in order to provide a broader spectrum of information and opinions. This blog focuses on bringing to light instances of gender inequality in order to promote gender equality. There are multiple different authors that post to the blog frequently. The layout is very plain and simple and enables the reader to focus on a summary of each individual post until they find one that they are compelled to read. 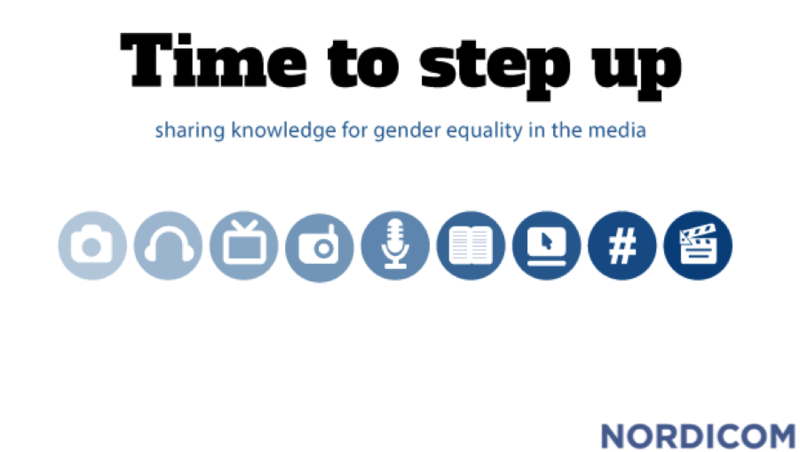 The posts are a combination of news articles and reports, personal opinions, links to different blogs, and many other forms that effectively promote gender equality by exposing the multiple instances of inequality that exist in our society today. While this website is not necessarily a blog, it has many features that are beneficial in spreading awareness and information about the HeForShe movement. It has a very modern and intriguing format to it that involves many pictures and avoids the use of an extensive and overwhelming amount of text. One of the most interesting features of the site is the interactive map on which you can see how many people have pledged to join the movement worldwide as well as in your country alone. The website also has links to social media for the movement including Facebook, Twitter, Instagram, and YouTube that is useful for monitoring news and progress of the movement. 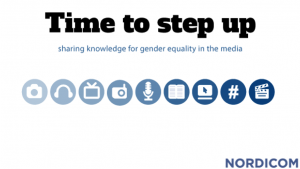 This blog focuses on promoting gender equality in education. While its main focus is equal education opportunities for women worldwide, there are also articles that pertain to women’s rights as a whole and highlight inequality in the modern world. This site utilizes many personal stories as well as news articles and incorporates pictures, quotes, videos, and text. The feminist movement has been alive for countless decades, promoting gender equality in all aspects of life – both societal and social. Personally, I find it somewhat appalling that, in the 21st century; women are still fighting to be considered up-to-standards with their male counterparts. And not the typical stereotyped intellectually lacking, submissive, hopeless, and helpless creature. No. Beings who are strong, independent, innovative, and brilliant are the true definition of women. In 1848 at the start of the movement, the fight for gender equality was a struggle led only by women for women. In recent years however, men have begun to stand up for women and girls to address the discrimination and inequalities faced on a daily basis. 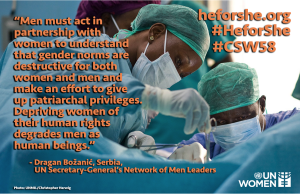 HeForShe, a fairly newly founded movement, describes itself as a “solidarity movement for gender equality that brings together one half of humanity in support of the other half of humanity, for the benefit of all.” Many of you have likely been exposed to at least the name of the movement, if not their goals, because of the recent promotions by Emma Watson, who was recently named the UN Women Global Goodwill Ambassador. I have attached the link to a video of her recent HeForShe speech at the United Nations UN Women 2014. The goal of the movement, in other words, is to turn the issue of gender inequality into one that is not just a women’s issue, rather a human rights violation as a whole. 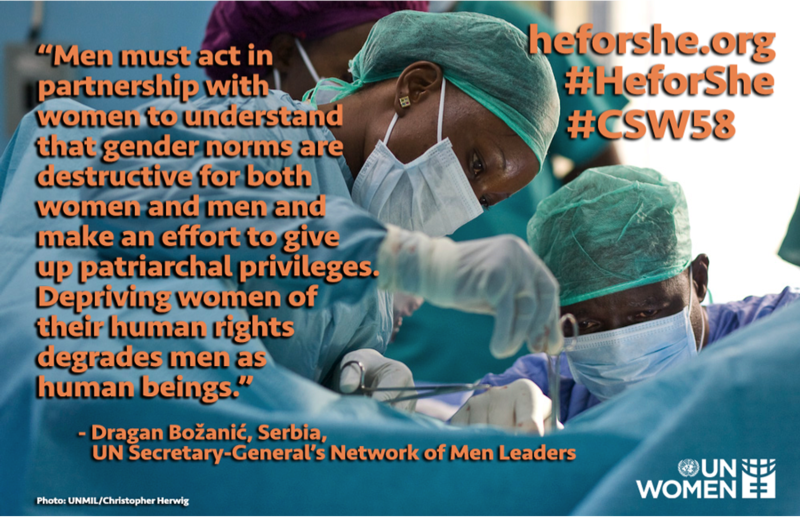 HeForShe, like the name implies, is recruiting men to unite together in the fight for women’s rights. So far, 180,330 men have joined the front worldwide and 52,475 have pledged in the United States alone. Pledge today and increase the numbers fighting for gender equality. This blog will follow the progress of the HeForShe movement as well as promote the feminism movement as it appears in education, the workplace, and society as a whole. I would like to say upfront that I am not an extreme feminist who believes that men are useless creatures and women should overpower the world. I do, however, believe in a world of equality for all genders, races, and sexualities. Welcome to your brand new blog at Georiga Perimeter College Sites.